Interior Secretary Ryan Zinke and his staff moved quickly and decisively last year to take down the wall of Obama-era rules and policies they saw as standing in the way of U.S. "energy dominance." Brick by brick, the barrier came down. "Across the Department we are striking the right balance to protect our greatest treasures and also generate the revenue and energy our country needs," Zinke said in a statement last week that accompanied his list of accomplishments during his first year at Interior. December brought at least three formal developments on the Interior Department's deregulatory checklist for the onshore oil and gas industry. The Bureau of Land Management suspended its methane and waste prevention rule, officially wiped out its congressionally disapproved planning regulation and completed rescission of its rule on hydraulic fracturing operations on public lands. Industry groups saw Friday's Federal Register notice on the fracking rule as an end to an eight-year battle to curb federal control over a practice that birthed the U.S. shale boom. "It was clear from the start that the federal rule was redundant with state regulation and politically motivated, as the prior administration could not point to one incident or regulatory gap that justified the rule," Western Energy Alliance President Kathleen Sgamma said in a statement last week. "Western Energy Alliance appreciates that BLM under Interior Secretary Ryan Zinke understands this rule was duplicative and has rescinded it." Conservation groups marked the holiday season with mournful postmortems of all the public lands regulations the Trump administration has unraveled. "Although more and more Americans are standing up to the administration's systematic, reckless efforts to undermine protections for our public lands, Secretary Zinke appears to be only interested in what the fossil fuel industry has to say," said Jenny Kordick, advocacy director for energy and climate at the Wilderness Society. Those changes are particularly frustrating in light of evidence that the oil and gas industry may not even want to work the land Interior is seeking to open, the group wrote in its year-end analysis. Low oil prices and a surplus of unused permits could indicate that energy firms may not be rushing to operate on federal land (Energywire, Aug. 4, 2017). Zinke hinted that 2018 will bring even more changes. "This is just the tip of the iceberg," he said. "Next year will be an exciting year for the Department and the American people." Legal action on the fracking rule rollback could dictate the direction of Interior's deregulatory strategy in 2018 and the years ahead. Environmental groups are poised to challenge the rescission (see related story). How that litigation plays out will help determine whether federal regulators use a "rip-it-up" or "write-it-again" approach to rulemaking under the Trump administration, according to a Thursday note from ClearView Energy Partners LLC. BLM has indicated that it will rewrite its methane rule — even if the new rule is severely limited, the researchers say. "In this context, the BLM fracking rule stands out as the first outright rescission of a major, far-reaching energy rule enumerated in" President Trump's energy independence executive order, the ClearView note says. "Simply put, if it works, we think it could potentially tilt the balance towards rescission (and the opposite seems likely if it fails.)" Interior could skip the Federal Register altogether and implement less official — yet potentially more pervasive — changes by redirecting the department's culture. There are hints that such a shift is already underway, said Jeremy Nichols, director of the climate and energy program at WildEarth Guardians. Documents obtained by the group under the Freedom of Information Act indicate that individuals in the Washington, D.C., offices of Interior and its sub-agencies are communicating new operational narratives to field staff. In a June 6, 2017, email to the manager of one of BLM's New Mexico district offices, Steven Wells, fluid minerals branch chief in D.C., tailored Trump's "Make America Great Again" campaign slogan to reflect the bureau's renewed focus on an oil-rich basin in the Southwest. "Indeed, I had planned to call a bit after the email update, but became distracted, will call you today, absolutely," Wells wrote. "Making the Permian Great Again — PGA," he signed off. The department's leadership appears to have no regard for findings by the Government Accountability Office and Interior's Office of Inspector General that the agency is lacking in its oversight of energy production and revenue collection, Nichols said. 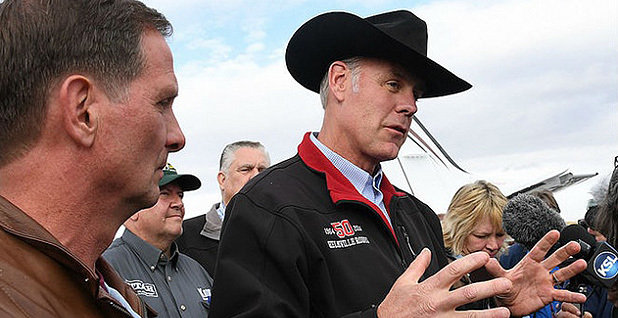 "Zinke didn't come in to fix the department," he said. "He's come in to advance an agenda." A November inspector general report found that Interior faces many "continuing and emerging challenges" on energy oversight (Energywire, Nov. 28, 2017). GAO has yet to weigh in on the changes floated by Zinke's Interior. As those proposals take effect in 2018 and beyond, the watchdog agency may begin its new analysis.